Aminoglycoside antibiotics are a central component of the treatment of pulmonary exacerbations of cystic fibrosis (CF) and slow the decline in lung function which ultimately causes the death of most patients. The prognosis of CF has improved, and thus side effects of treatments have become increasingly important. Observational studies suggest that the morbidity from side effects of aminoglycosides is disturbingly common, and that aggressive treatment may lead to more side effects. This review of the current literature on side effects of aminoglycosides considers the pathophysiological mechanisms, epidemiology and risk factors, investigation of side effects and preventative strategies. Treatments which have shown early promise are identified and areas of future research are discussed. Cystic fibrosis (CF) is the most common life-limiting autosomal recessive disorder in the Caucasian population with approximately 7000 affected individuals in the UK.1 A mutation in the CF gene leads to a defective or absent CF transmembrane conductance regulator (CFTR) which, in most patients, ultimately leads to bronchiectasis and chronic infection with Pseudomonas aeruginosa. Intravenous aminoglycosides are used for exacerbations owing to their efficacy against P aeruginosa. Patients often require several courses of intravenous antibiotics per year. The survival of patients with CF has improved, and side effects of treatment have become increasingly important. We review the current literature on the side effects of aminoglycosides commonly used to treat pulmonary exacerbations of CF. The major side effects of aminoglycosides are kidney injury, hearing impairment and vestibular toxicity. The tenacity of infection and altered pharmacokinetics in CF necessitate long courses of high-dose antibiotics.5 Since the introduction of regular 3-monthly intravenous antibiotic therapy for patients with chronic P aeruginosa in Danish CF clinics in the mid-1970s,6 the management of pulmonary infection in CF has become more aggressive. However, case reports of acute kidney injury (AKI; previously termed acute renal failure) associated with aminoglycoside antibiotics in CF were not published until the late 1990s. The first report of AKI secondary to intravenous aminoglycosides in CF7 was followed by several other cases and mini-series. Inhaled tobramycin has also been implicated.8 Bertenshaw et al9 conducted a national survey of AKI in patients with CF (AKI was pragmatically defined as an increased serum creatinine for age) and found that the incidence was 4.6–10.5/10 000 CF patients/year. A subsequent case–control study10 established that an aminoglycoside in the previous week increased the risk of AKI >80-fold. Risk factors for renal impairment (including CF-related diabetes, non-steroidal anti-inflammatory drugs and acute dehydration) were strongly associated with AKI (OR 24.0). Exposure to gentamicin in the previous year was associated with AKI while exposure to tobramycin was not. Regular courses of aminoglycoside antibiotics may cause subclinical kidney damage leading to chronic kidney disease (CKD). This can manifest at the level of the glomerulus (causing decreased glomerular filtration rate, GFR) and the tubules (causing altered excretion of electrolytes). The stages of CKD are shown in table 1. Pederson et al11 described a series of 46 patients aged 10–35 years who had received a mean of 20 courses of tobramycin and used 24 h urinary creatinine clearance to assess renal function. The cumulative dose of tobramycin was not related to the creatinine clearance; 39% of patients had reduced GFR (defined as <96 ml/min/1.73 m2). However, 24 h urinary creatinine collections are known to be unreliable, especially in children. The largest study investigating CKD in CF was reported by Al-Aloul et al.12 Creatinine clearance was measured in 24 h urine collections in 80 adult patients with CF chronically infected with P aeruginosa. Multiple urinary collections per patient were taken to ensure accuracy. The median number of courses of antibiotics per patient was 40 (range 1–130); 42% of patients had a creatinine clearance <80 ml/min/1.73 m2. Creatinine clearance declined with increasing number of antibiotic courses (r=0.59). Colistin was not associated with decreased kidney function when administered with a β-lactam but, when administered with an aminoglycoside, the two agents together were associated with more kidney damage than an aminoglycoside alone. Creatinine clearance can be predicted using equations such as the modification of diet in renal disease (MDRD) and Cockroft–Gault formulae. In this study, the Cockroft–Gault formula to predict creatinine clearance performed poorly and missed cases of CKD. Investigators have used biomarkers to obtain indirect evidence of subclinical kidney injury in many research settings. N-acetyl-β-d-glucosaminidase (NAG), one of the best characterised biomarkers, is a proximal tubular enzyme excreted in the urine in response to kidney damage. Paediatric patients with CF administered intravenous tobramycin have increased urinary NAG levels which remain elevated weeks after treatment.13 However, patients taking inhaled gentamicin also have increased urinary NAG levels,14 suggesting that the test is highly sensitive and may not indicate clinically important renal damage. The literature on direct comparisons of alternative intravenous agents in CF is complex. Comparing the relative toxicities of tobramycin and colistin in an observational study, Etherington et al15 found that tobramycin was associated with a larger acute rise in NAG. However, increased baseline NAG levels (perhaps indicating chronic toxicity) prior to antibiotics was associated with a higher cumulative colistin dose rather than a cumulative tobramycin dose. In comparison, Al-Aloul et al12 found that, when administered with a non-nephrotoxic agent, colistin was cumulatively less nephrotoxic than tobramycin. Aminoglycosides can affect the nephron at the level of the glomerulus and the tubule, although the latter has been more extensively studied. Insights into the potential mechanisms of decreased glomerular filtration have been gained from ultrastructural studies.24 Exposure of the glomerulus to gentamicin decreases the surface area available for ultrafiltration, the basement membrane increases in thickness, the glomerulus changes in shape and the number and diameter of fenestrae decrease. The effect of gentamicin on the proximal tubular cell is summarised in figure 1. After uptake, a number of cellular processes are activated, culminating in apoptosis. This contributes to loss of the renal tubular epithelium and thus kidney dysfunction but, conversely, shedding and urinary excretion of apoptotic bodies may excrete aminoglycosides. Potential cellular mechanism of toxicity. This diagram summarises the major themes of the literature, much of which is in vitro work and so has to be interpreted as a model. Gentamicin enters the tubular cell via the multiligand receptor megalin (shown in blue) and then uptake is via a clatharin-coated pit. Gentamicin passes in a retrograde manner via the lysosomes, Golgi and endoplasmic reticulum into the cytoplasm where it forms complexes with iron which catalyse the formation of reactive oxygen species (ROS). In the lysosomes, gentamicin causes release of the pro-apoptotic cathepsins and, in the endoplasmic reticulum, gentamicin causes release of the pro-apoptotic stress protein von Hippel–Lindau binding protein 1 (VBP1). Cytosolic gentamicin either directly or indirectly (via ROS) causes the release of cytochrome C from the mitochondria, a key step in apoptosis. ROS cause an increase in the gene expression of oxidative stress-inducible genes, stress-inducible chaperones and oxido-reductive enzymes. Gentamicin may have intracellular effects without entry to the cell. It can cause a rapid increase in intracellular Ca2+ and an early increase in the anti-apoptosis and pro-proliferative signals Akt and Erk; this may be mediated by the membrane Ca2+ receptor CaR (shown in purple). Strategies to reduce nephrotoxicity already exist. Attention to the dose prescribed and monitoring serum levels are paramount in this. Patients with CF who develop AKI are more likely to have received gentamicin in the preceding year than tobramycin when compared with controls,10 so tobramycin is the preferred aminoglycoside in CF. Avoidance of risk factors such as concurrent non-steroidal anti-inflammatory drugs and dehydration would seem prudent. Manipulation of the dosing regimen provides a cost-effective and simple method of reducing kidney injury. Given the saturable uptake of aminoglycosides, it follows that a single daily dose would be expected to be less nephrotoxic than the same daily dose in three divided doses (see figure 2). The TOPIC study, a large randomised trial of tobramycin for patients with CF, established that there is equal efficacy with a single daily dosing regimen as with a multiple daily dosing regimen,27 a finding confirmed in a subsequent meta-analysis.28 In the paediatric group receiving a single daily dose, the serum creatinine level decreased during the course of treatment compared with a rise in the group receiving three divided doses. In further support of renal safety, in the once daily arm the rise in NAG was 33% less than in the group receiving a three times daily regimen in both adults and children. Effects of saturable uptake on kidney cortical accumulation in single daily versus three times daily dosing. In three times daily dosing (shown in red), all of the area under the curve (AUC; red shaded area) contributes to the uptake of the aminoglycoside into the kidney cortex. However, above a certain threshold (indicated by the arrow), the receptor-mediated uptake of the aminoglycoside is saturated and serum concentrations above this level do not contribute to the uptake of aminoglycoside into the renal cortex. As this threshold is exceeded in single daily dosing (shown in green), a proportion of the single daily dose AUC does not contribute to renal uptake. Thus, the area below this threshold contributes to renal uptake (the green area in single daily dosing). As the green area is smaller than the red area, the renal uptake in single daily dosing is thought to be lower than with the three times daily dosing regimen. The pharmacokinetics of aminoglycosides are complicated by a circadian rhythm in elimination. In the once daily group of the TOPIC study, most of whom received their antibiotics in the evening, there was a lower elimination rate of tobramycin than in the three times daily group.29 There may be a diurnal variation in renal clearance of the drug, with decreased clearance occurring at night. This would lead to increased exposure of the kidneys to aminoglycoside during the course of the illness if the drug is administered at night compared with the morning. This hypothesis requires testing in clinical trials. Estimates of the prevalence of ototoxicity in patients with CF depend on the methods used and definitions of hearing impairment. The most straightforward measurement of hearing impairment is the pure tone audiogram (PTA). In this, the patient listens to a series of different frequencies and the quietest sound level at each frequency which can be reliably heard is established (the ‘threshold’ level, measured in decibels (dB)). A selection of the numerous studies reporting PTAs in CF which clearly report the population studied, the definition of hearing impairment and the sample prevalence is given in table 2. A frequently cited report of the prevalence of hearing impairment is that of Mulheran et al.30 They studied 70 patients recruited from a CF clinic and, using the definition of ≥2 thresholds of >20 dB or one of >25 dB, they found an overall prevalence of hearing impairment of 17%. 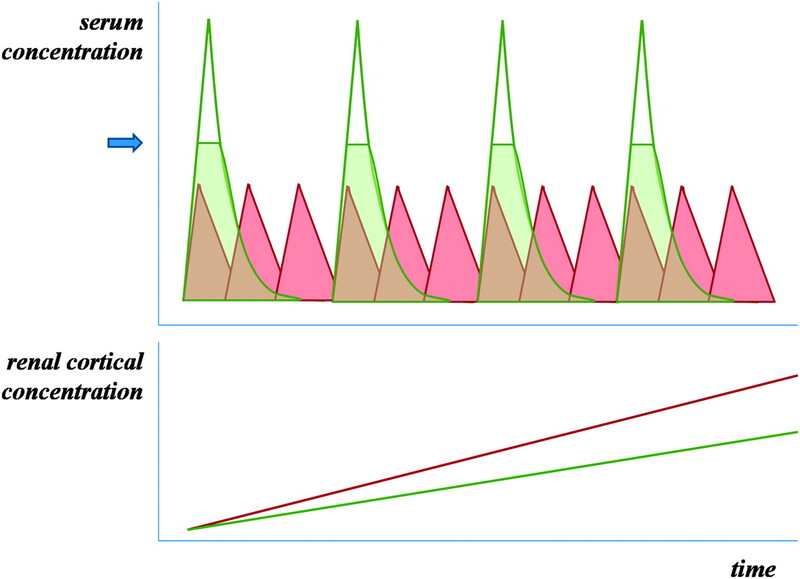 Several DPOAE parameters can be measured including amplitude (volume) and latency (the amount of time for a pair of tones to travel from the ear canal to the cochlea, generate a DPOAE and return this tone back to the ear canal). The numerous methods of calculating the latency complicate the literature. Patients with CF exposed to high cumulative doses of tobramycin have alterations in latencies.32 The relevance of these findings (eg, early detection of ototoxicity) has yet to be fully understood. Aminoglycoside ototoxicity causes degeneration of hair cells in the organ of Corti,35 predominantly in the basal turn which is required to sense high-frequency sounds. Extracellular signalling normally causes influx of calcium into hair cells. After gentamicin exposure, calcium influx no longer occurs in basal hair cells but persists in apical hair cells.36 Thus, a clear relationship exists between the clinical features of high-frequency hearing loss, pathophysiological and histological findings. Several mitochondrial ribosomal mutations are associated with ototoxicity. The most well known is the A1555G mutation in the MT-RNR1 mitochondrial gene described by Prezant et al.39 This confers a high risk of ototoxicity when an individual with the mutation is exposed to aminoglycosides. Conrad et al40 studied an unselected group of 153 adults with CF; 42.2% were found to have “mild” ototoxicity and 8.6% had “moderate to severe ototoxicity”. The investigators sequenced portions of the MT-RNR1 gene of all the patients and found five with polymorphisms previously proposed as mutations associated with hearing impairment; three of these patients had hearing impairment, which was severe in two cases. They also identified variation in 16 other positions, five of whom had hearing loss. Measures to reduce the generation or effects of ROS due to aminoglycosides have been extensively investigated and there are several promising avenues of research. A brief report of a randomised trial of aspirin versus no aspirin for 14 days in 195 patients treated with gentamicin showed a lower incidence of hearing impairment with aspirin (3% vs 13%; p=0.013).44 Additionally, a randomised trial comparing N-acetylcysteine (NAC) versus no NAC in adult patients on dialysis treated with gentamicin reported fewer cases of hearing impairment in the NAC group (20% vs 55%, p=0.022).45 Both of these preliminary results require confirmation but are nevertheless encouraging. Vestibulotoxicity due to aminoglycosides is secondary to damage of the hair cells in the vestibular system and does not necessarily occur with cochleotoxicity. Early symptoms of vestibulotoxicity, often insidious in onset, include vague dizziness and feeling light-headed. These may easily go unrecognised. Partial recovery can occur but can take several months. There is little published literature regarding the prevalence of vestibulotoxicity in CF owing to the difficulty of defining and measuring it, particularly in children. A number of possible tests are available to screen for vestibular dysfunction, many of which are technically challenging for the non-specialist. Two studies have systematically screened for vestibulotoxicity in CF. Thomsen et al reported a study of 53 patients with a mean age of 11.8 years who had received a mean of 3.2 courses of tobramycin.46 A differential caloric test was performed and, in this series, no patients had an abnormal result. Scheenstra et al47 reported a detailed investigation of 23 patients with CF in the Netherlands, 30% of whom had peripheral vestibular loss diagnosed by electronystagmography (often considered the gold standard test). Of three patients who reported symptoms which suggested horizontal vestibular function loss such as rotatory dizziness, one patient had severe bilateral vestibular dysfunction. There was no association between cumulative exposure to tobramycin and vestibulotoxicity. Comparison of the aminoglycoside exposure of the two studies is difficult as the study by Thomsen et al reported mean courses of antibiotics while the study by Scheenstra et al reported cumulative area under the curve. It is likely that the patients in the study by Scheenstra et al had a higher cumulative exposure to tobramycin. Patients with CF have a large lifetime exposure to multiple medications. Aggressive treatment with intravenous antibiotics slows the progression of lung disease, decreases morbidity and delays mortality, with a cost of an increased risk of side effects. Minimising the risk of side effects is of paramount importance within the ‘first, do no harm’ principle. Recent single-centre studies have suggested that the prevalence of side effects such as chronic kidney disease, ototoxicity and vestibulotoxicity are disturbingly high in the CF population. If these findings are confirmed, clinicians will need strategies to minimise the risk of toxicity. CKD has implications for lung transplantation as it is well recognised that further nephrotoxicity occurs after transplantation. Currently, there are limited options for monitoring the early signs of toxicity. Serum creatinine-based formulae are poor at predicting renal function in the CF population; a biomarker which reliably predicts GFR (or screens patients for renal impairment) is urgently needed in the clinical setting. Similarly, once the PTA has become abnormal due to aminoglycoside ototoxicity, hearing is not expected to improve. Further research evaluating the role of DPOAEs as an early marker of cochlear damage is required. Some strategies have already been widely adopted, such as once daily aminoglycosides, the use of tobramycin rather than gentamicin and careful monitoring of drug levels. Other approaches such as the optimum time of day of administration of antibiotics, screening for mutations which predispose to ototoxicity and the use of aspirin and NAC in patients with CF require careful consideration and further research.
. Cystic fibrosis. BMJ 2007;335:1255–9.
. Risk factors and comparisons of clinical nephrotoxicity of aminoglycosides. Am J Med 1986;80:119–25.
. Choice of drug and dosage regimen. Two important risk factors for aminoglycoside nephrotoxicity. Am J Med 1986;80:115–18.
. Randomized trials of aminoglycoside antibiotics: quantitative overview. Rev Infect Dis 1988;10:951–7.
. Clinical pharmacokinetics of antimicrobial drugs in cystic fibrosis. Pharm World Sci 1998;20:149–60.
. Improved survival in the Danish center-treated cystic fibrosis patients: results of aggressive treatment. Pediatr Pulmonol 1996;21:153–8.
. Aminoglycoside-induced nephrotoxicty in cystic fibrosis: a case presentation and review of the literature. Am J Ther 1996;3:248.
. Acute renal failure in cystic fibrosis: association with inhaled tobramycin therapy. Pediatr Pulmonol 2002;34:375–7.
. Survey of acute renal failure in patients with cystic fibrosis in the UK. Thorax 2007;62:541–5.
. Case-control study of acute renal failure in patients with cystic fibrosis in the UK. Thorax 2008;63:532–5.
. Cumulative and acute toxicity of repeated high-dose tobramycin treatment in cystic fibrosis. Antimicrob Agents Chemother 1987;31:594–9.
. Renal impairment in cystic fibrosis patients due to repeated intravenous aminoglycoside use. Pediatr Pulmonol 2005;39:15–20.
. The effects of intravenous tobramycin on renal tubular function in children with cystic fibrosis. J Cyst Fibros 2005;4:221–5.
. Urinary N-acetyl-beta-D-glucosaminidase activity in patients with cystic fibrosis on long term gentamicin inhalation. Arch Dis Child 1998;78:540–3.
. Measurement of urinary N-acetyl-b-D-glucosaminidase in adult patients with cystic fibrosis: before, during and after treatment with intravenous antibiotics. J Cyst Fibros 2007;6:67–73.
. Symptomatic hypomagnesemia in cystic fibrosis. J Pediatr 1985;107:425–8.
. Aminoglycosides lower serum magnesium concentrations in patients with cystic fibrosis: a retrospective study. J Am Diet Assoc 1995;95:1152–4.
. Integrated pathway analysis of rat urine metabolic profiles and kidney transcriptomic profiles to elucidate the systems toxicology of model nephrotoxicants. Chem Res Toxicol 2008;21:1548–61.
. Identification of putative gene based markers of renal toxicity. Environ Health Perspect 2004;112:465–79.
. Renal disposition of gentamicin, dibekacin, tobramycin, netilmicin, and amikacin in humans. Antimicrob Agents Chemother 1985;27:520–4.
. In vivo uptake kinetics of aminoglycosides in the kidney cortex of rats. J Pharmacol Exp Ther 1986;236:470–5.
. Accumulation pharmacokinetics of tobramycin. Antimicrob Agents Chemother 1978;13:649–56.
. Influence of dosage schedule on renal cortical accumulation of amikacin and tobramycin in man. J Antimicrob Chemother 1991;27(Suppl C):41–7.
. Renal ultrastructural and biochemical injuries induced by aminoglycosides. Environ Health Perspect 1984;57:293–9.
. Aminoglycosides inhibit hormone-stimulated Mg2+ uptake in mouse distal convoluted tubule cells. Can J Physiol Pharmacol 2000;78:595–602.
. Aminoglycosides: nephrotoxicity. Antimicrob Agents Chemother 1999;43:1003–12.
. Once versus three-times daily regimens of tobramycin treatment for pulmonary exacerbations of cystic fibrosis–the TOPIC study: a randomised controlled trial. Lancet 2005;365:573–8.
. Once-daily versus multiple-daily dosing with intravenous aminoglycosides for cystic fibrosis. Cochrane Database Syst Rev 2006;(3):CD002009.
. Population pharmacokinetics of tobramycin administered thrice daily and once daily in children and adults with cystic fibrosis. J Cyst Fibros 2007;6:327–33.
. Occurrence and risk of cochleotoxicity in cystic fibrosis patients receiving repeated high-dose aminoglycoside therapy. Antimicrob Agents Chemother 2001;45:2502–9.
. Comparison of distortion product OAE generation between a patient group requiring frequent gentamicin therapy and control subjects. Br J Audiol 1997;31:5–9.
. Effects of chronic tobramycin treatment on distortion product otoacoustic emissions. Ear Hearing 1999;20:393.
. Ultrastructural localization of megalin in the rat cochlear duct. Hear Res 1999;129:83–91.
. Kinetics of gentamicin in cochlear hair cells after chronic treatment. Acta Otolaryngol 1992;112:272–7.
. Aminoglycoside ototoxicity. Otol Neurotol 2001;22:266–8.
. Effects of gentamicin and pH on [Ca2+]i in apical and basal outer hair cells from guinea pigs. Hear Res 2001;154:81–7.
. Supplemental iron exacerbates aminoglycoside ototoxicity in vivo. Hear Res 1998;115:1–5.
. Minocycline prevents gentamicin-induced ototoxicity by inhibiting p38 MAP kinase phosphorylation and caspase 3 activation. Neuroscience 2005;131:513–21.
. Mitochondrial ribosomal RNA mutation associated with both antibiotic-induced and non-syndromic deafness. Nat Genet 1993;4:289–94.
. Frequency of mitochondrial 12S ribosomal RNA variants in an adult cystic fibrosis population. 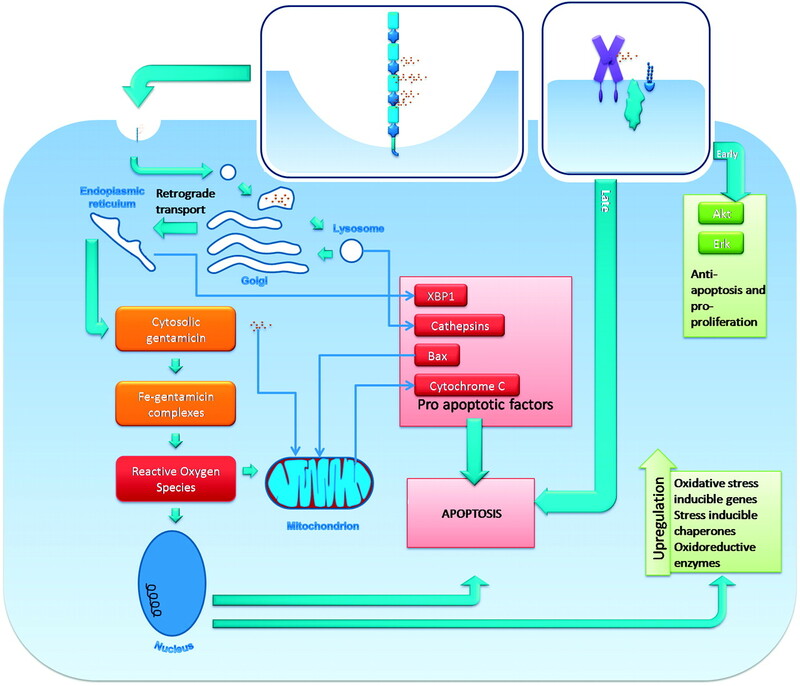 Pharmacogenet Genomics 2008;18:1095–102.
. Pharmacogenomic testing to prevent aminoglycoside-induced hearing loss in cystic fibrosis patients: potential impact on clinical, patient, and economic outcomes. Genet Med 2007;9:695–704.
. Prevalence of mitochondrial 1555A–>G mutation in European children. N Engl J Med 2009;360:640–2.
. Prevalence of mitochondrial 1555A–>G mutation in adults of European descent. N Engl J Med 2009;360:642–4.
. Aspirin to prevent gentamicin-induced hearing loss. N Engl J Med 2006;354:1856–7.
. Gentamicin-induced ototoxicity in hemodialysis patients is ameliorated by N-acetylcysteine. Kidney Int 2007;72:359–63.
. Tobramycin ototoxicity. Repeated courses of high dosage treatment in children with cystic fibrosis. J Antimicrob Chemother 1979;5:257–60.
. Vestibulotoxicity as a consequence of systemically administered tobramycin in cystic fibrosis patients. Acta Otolaryngol 2009;129:4–7.
. Chronic renal failure. In: Rees L, Webb NJA, Brogan PA, eds. Paediatric nephrology. Oxford: Oxford University Press, 2007:394–5.
. Cystic fibrosis and hearing loss. Arch Otolaryngol 1979;105:338–42.